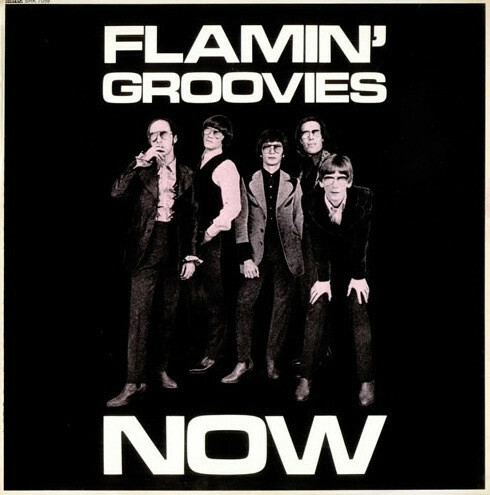 San Franscico cult band the Flamin’ Groovies started in 65 and had a big influence on Power Pop and early Punk bands. They recently did a tour playing at Johnny Brenda’s on the Philly stop. 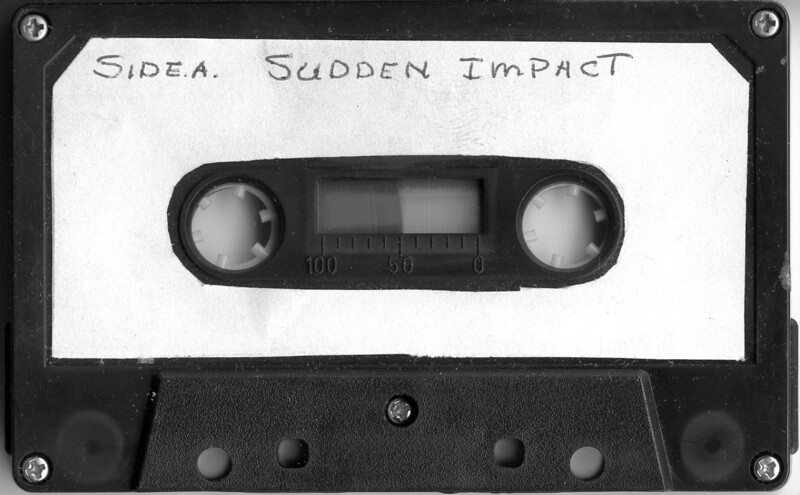 This is a recording of them from 1978 playing a club called Stars which was in Old City. 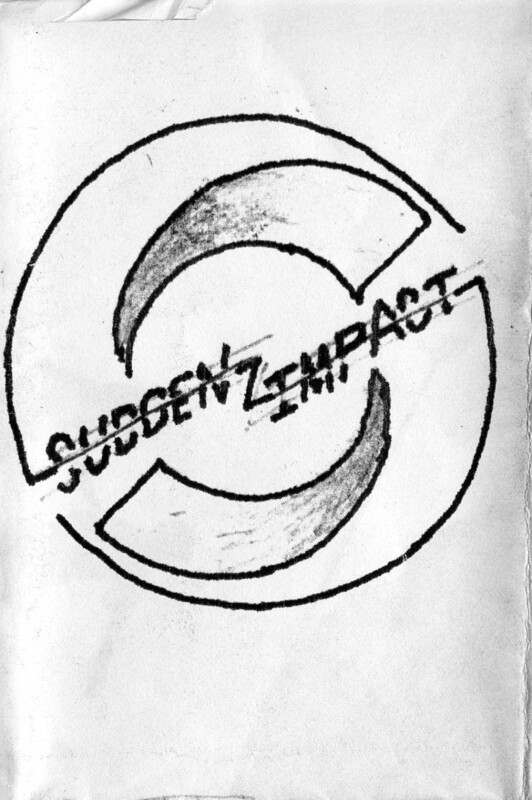 Sudden Impact was around before I moved to Philly so I don’t know much about them. From what Ive been told they weren’t around very long and only played maybe 4 or 5 shows. 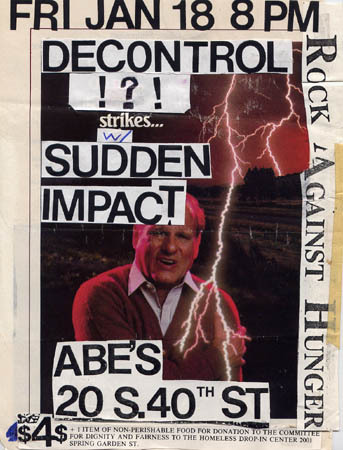 The only thing else I know is that Beebe later of Homo Picnic was in the band. 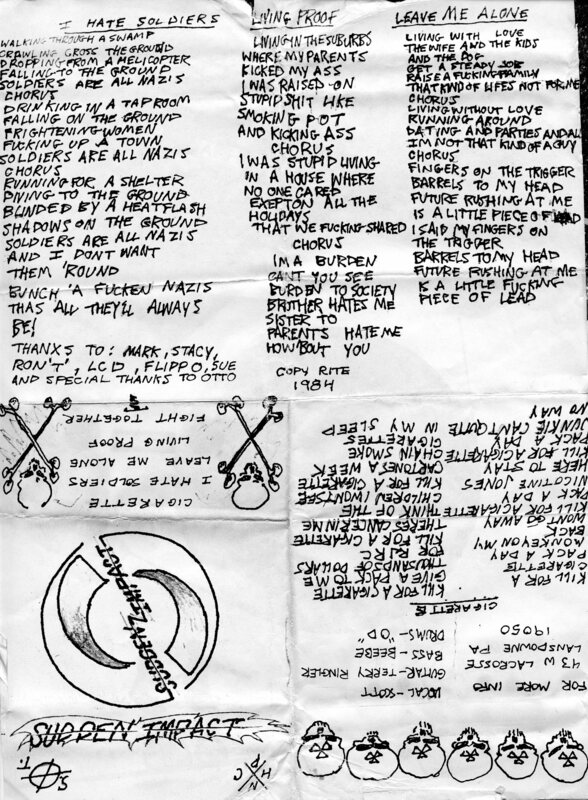 This is a 5 song demo of there’s from 1984. 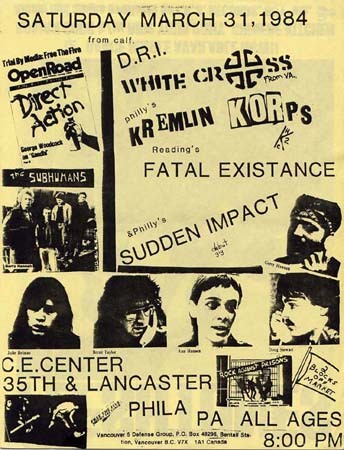 Toxic Reasons live from the CE Center in West Philadelphia. 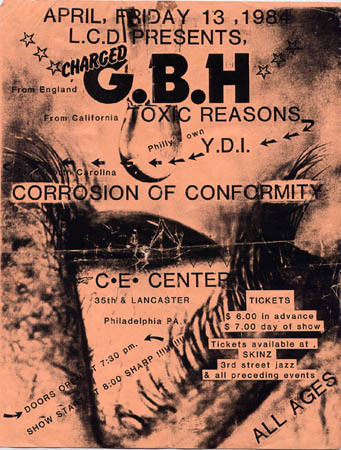 Opening up for Charged GBH along with COC & YDI. They played a mix of songs of their first album Independence and their 2nd album Kill By Remote Control. 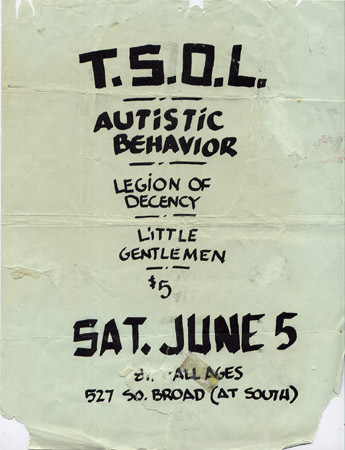 I wanted to get this up today since TSOL is opening for the Damned tonight at the TLA. They opened for Flag last year and were really good so I’m looking forward to seeing them again. I will put up more info about this show later. Besides the songs from the show there is a great interview with Jack Grisham by Lenny Crunch and others, with a lot of info about the early days of TSOL. 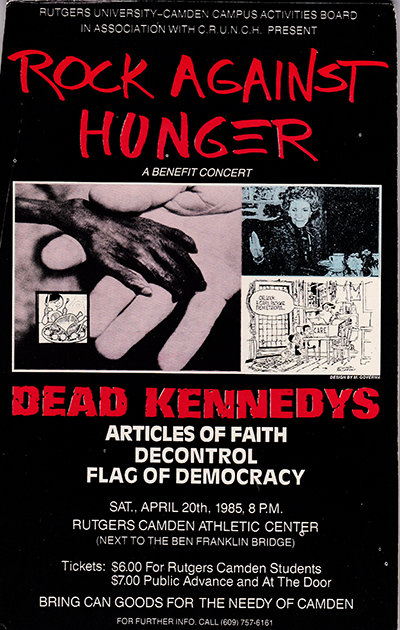 Crunch Productions show with the Dead Kennedys from Rutgers Camden on April 20, 1985. Another show from within a year of my moving to Philly but at least I got to see them later at Blue Horizon. 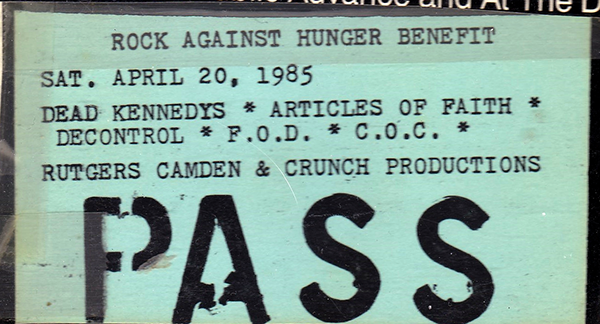 What a great lineup this show had – opening for the Dk’s was Articles of Faith, COC, Decontrol & FOD. 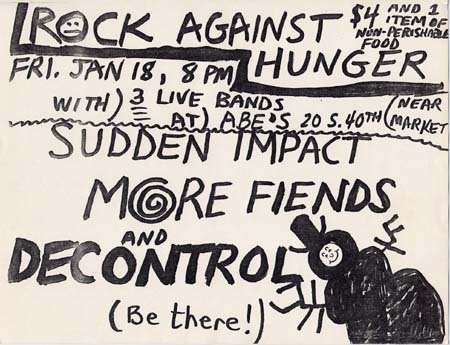 At the time the largest independent punk show in the area Rutgers put the total attendance at 3,100. 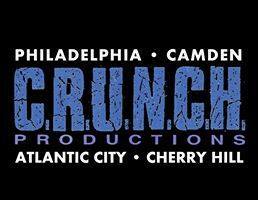 Really Huge THANKS to Lenny Crunch for letting me transfer this video and put it up.